It was a quiet night, and the atmosphere was slightly subdued as our thoughts were with Green who had had a very rough day and therefore wasn’t with us. Burgundy and Blue were still eating, so Pine, Red and Ivory began punching out Pine’s brand-spanking, new copy of the “Feature Game”, Azul. This week, Azul won the Spiel des Jahres Award, but despite the fact that it only came out at Essen last year, and has been difficult to get hold of for much of the time, we’ve still managed to play it a lot. Even so, Red seemed to have managed to miss out, so an explanation of the rules was in order. It is quite simple to play, if a little abstract. The idea is that players are tile laying artists decorating a wall in the Palace of Evora with “azulejos”. 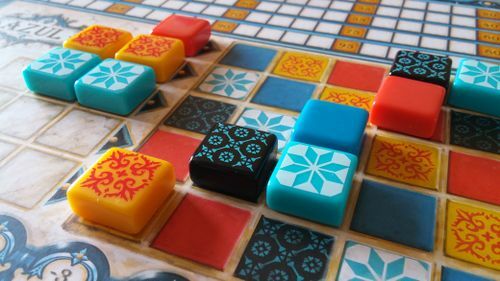 On their turn, the active player can either take all the tiles of one colour from one of the factory displays (putting the rest in the central market) or take all the tiles of one colour from the market in the centre of the table. They then place the tiles in one of the five rows on their player board. Each row can only contain one colour, but players may have more than one row with any given colour. The catch is that each player only has five rows, each with a set number of spaces, one to five. Players can add tiles to a row later in the round, but once a row is full, any left-overs go into the negative scoring row. Once all the tiles have been picked up, players evaluate their board, and, starting with the shortest row, one of the tiles from each full row is added to the player’s mosaic and scored. Players score one point for a tile that is not placed adjacent to any other tile, whereas tiles added to rows or columns score the same number of points as there are tiles in the completed row (or column). The game continues with players choosing tiles from the factory displays and then adding them to rows, the catch is that as the mosaic fills up, it is harder to fill the rows as each row can only take each colour once. 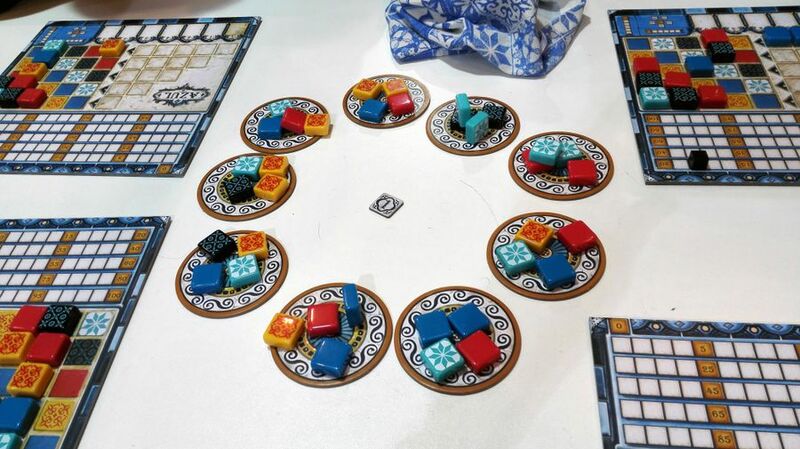 End game bonuses, keep everyone guessing right up to the end which adds interest and occasionally it can be really nasty when someone ends up with a pile of tiles they can’t use. Red, Ivory and Pine got going quickly, and once Burgundy and Blue had finished with their supper, they moved to a table near the door to make the most of the draught and started a second game with Black and Purple. Having played the game quite a bit, nobody pulled their punches: It was only the second round when Blue had to pick up ten yellow tiles netting her fourteen negative points. She was fortunate that she didn’t have fourteen to lose, but when Black picked up seven yellow tiles a couple of rounds later he was less lucky. On the next table Ivory was being nasty to Pine, leaving him with Hobson’s Choice and minus ten points either way. Playing “dirty” clearly worked for Ivory as he won the first game, though there was some confusion of the scoring, which Pine blamed on his over-hot head. Red, Pine and Ivory had started their game first, and with only three players compared with four on the other table, it was no surprise that that also finished first. As they were looking round for something to play, Red spied Yardmaster, one of her favourite games, in Blue’s bag. Neither Pine nor Ivory had played it before, but it wasn’t difficult for Red to persuade them to give it a go. Unlike most other train games, in Yardmaster, players are building a locomotive rather than routes. On their turn players can do two from the three possible actions: draw a cargo card (either blind or from the face up discard pile); buy a railcar card from the four face up cards in the middle, or swap their “Exchange Token” with any other one around the table. To buy a railcar, players pay using sets of cargo cards, so a yellow number three railcar will cost three yellow “oil” cards. The exchange tokens allow players to use other cargo cards at a rate of two-to-one, however, if a player only had two yellow oil cards but also had two blue “coal” cards and the blue exchange token, they would still be able to buy the yellow number three railcar. When buying a railcar, if the number or colour match the previous car, then it must be added to the end of their locomotive. If not, then players can park it in their personal sorting yard and add it later, when another railcar is being bought and added to the locomotive. This is the clever part of the game as it allows players to “stack” points in their personal train yard enabling them both to take some risks and strategically remove railcars from the grasping hands of their opponents. Players score is the total of the numbers of the on the railcars making up their locomotive at the end of the game. Ivory started out with a really clever move, using a discarded “extra move” cargo card to take another “extra move” card and Pine and Red thought it was all over before it had begun. It wasn’t though, and despite it being a very short game, Ivory quickly got bogged down trying to buy a high value, “Purple Four”, which gave both Red and Pine the chance to get past him. Although he was new to the game, it was clearly one that made sense to Pine who finished four points ahead of Red. As both games finished Blue, Burgundy, Black and Purple moved back to the group’s usual table and the options were discussed. With seven players and Red present, Bohnanza was always a possibility, but with the heat sapping everyone’s strength, nobody fancied playing anything too strenuous and the deal was sealed. Everyone is very familiar with this, even Ivory who has played it the least, so as Burgundy shuffled the deck and removed the cocoa and garden beans, everyone else reminded each other of the rules: must plant the first card in hand, may plant the second as well; turn over two cards from the deck which must be planted before any other deals can be finalised; trading can only be with the active player; draw four cards at the end of a turn; two coins for a third bean field; fields with only one card can’t be ploughed in unless they all have only one card, and don’t forget – you can’t rearrange your hand! As usual with a large number of players, it was a tight game and everyone spent most of it telling people not to trade with everyone else as they were winning. Three times through the deck doesn’t take long and people don’t get many turns, but it was Blue, Black and Purple who stood on the podium at the end with everyone else within a point of each other. It was Blue who made up for her dire showing in Azul though, beating Black into second place by a massive two points. There was still time to play something else, but the heat had clearly got to everyone as the conversation degenerated into a discussion about everyone’s favourite childhood cartoons and how many had inspired boardgames. The late, great Peter Firmin‘s Ivor the Engine and Noggin the Nog both got a mention, but then age and nationality created a bit of a divide, and the evening ended with Pine crowing, “My name’s Pig and I like cream cakes!” His head was definitely over-hot. Learning Outcome: Children’s TV programs were very weird in the 1970s. * Queendomino is the follow-on to the 2017 Spiel des Jahres winner, Kingdomino. When the group played it, we found the new game replaced the smooth elegance of the original with a more clunky, complex, long-winded game that was no where near as good as the games it was trying to compete with (much like Tsuro of the Seas a couple of years before). This entry was posted in Games Night and tagged Azul, Azul: Stained Glass of Sintra, Bohnanza, Ivor the Engine, Kingdomino, Queendomino, Tales of the Northlands: The Sagas of Noggin the Nog, Tsuro of the Seas, Yardmaster on August 6, 2018 by nannyGOAT.